Co-winner of the 2006 Shumpeter Prize for best writing on evolutionary economics over the preceeding two years. 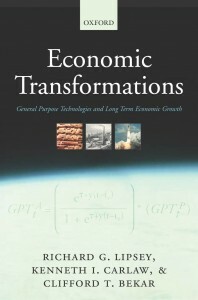 This book uses historical, institutional and theoretical analysis to examine long term economic growth. The authors argue that growth is driven by all types of technological change and very long term growth mainly by the transforming technologies that are now called general purpose (GPTs). Early chapters survey this growth experience and argue that the things singled out by neo-classical theory as undesirable market distortions, such as "deadweight" monopoly profits and asymmetric knowledge, are the very forces that drive economic growth. The analysis then distinguishes between technological knowledge and the structure in which it is embodied, which they call the “facilitating structure”. The authors then argue that the so-called productivity paradox results from a failure to make this distinction and when it is made, there is no paradox in observing major changes in technology and little or no changes in productivity. The authors then identify about two dozens GPTs that have transformed the economic, social, and political landscape in the 10,000 years since the Neolithic Agricultural Revolution. The transforming effects of these are studied in some detail. Next, the twin questions are raised: Why did the sustained extensive growth that was initiated by the Industrial Revolution happen endogenously in the West? (2) Why did it not happen endogeneously elsewhere, particularly in China or the Islamic countries? It is argued (contrary to the “unified growth theory” or UGT), that the answer is too complex to be modeled formally, given the current state of the profession and so must be found through historical analysis. The authors’ answer is that the main difference between the West and all the rest was the existence of Western science in general and Newtonian mechanics in particular—present in the West and particularly in the UK but absent elsewhere. The roots of this science and its failure to develop elsewhere are traced back to the early histories of both religion and institutions. The issue of the emergence of sustained intensive growth is then studied using a series of formal growth models containing endogenous population. The results show when Malthusian conditions apply and when they do not. It is argued that the assumptions needed for Malthusian results are counter-factual. After that, it is argued that once sustained growth has been established, further growth can be analyzed through formal models. To do this, the authors build non-conventional, dynamic, non-stationary-equilibrium models that incorporate a range of phenomena that their historical studies show to be important but which are excluded from other GPT models in the interests of analytical tractability. The book concludes with a study of the policy implications that follow from their evolutionary approach to growth and contrasts these with the, often diametrically opposed, policy recommendations that follow from neo-classical economics. Foreword: The Canadian Institute for Advanced Research and this Book. Preface: Why Another Book on Growth? Chapter 8: Why Not Elsewhere?